Everyone thinks they have time for motherhood, for having kids, for not having kids, for making decisions. Everyone thinks they have enough time until all of a sudden they don't. "You're on the clock here," Luscheck said, and truer words were never spoken at Litchfield. These women are running out of time, or time isn't going fast enough, and nothing marks the passage of time like birth and death. This cycle of waiting for life to start (or death to come) is perfectly encapsulated in the Mother’s Day celebration for the inmates. Some women have no time, like Poussey, whose mom has passed; and some women think they have all they time they’ll need, like Wanda, who still might want kids and isn’t worried about her age because her mom had her at 49. As the inmates get ready for the celebration, everyone has different ways of dealing with the time they wish they had, with their moms, with their kids, or for themselves. Sophia’s hair salon is open only for mothers, so they can get ready to see their kids. Maria wants her hair to look exactly the same as the last time her baby saw her (it’s called “object permanence”). Morello lies, as she always does, saying she has four kids visiting her and she needs to look nice for them. In reality, she just wants to get dolled up to feel a little better about herself. Luscheck and Piper talk about different ways they could kill themselves before he tells Piper that the Betty Page of Litchfield is back inside. He means Alex, of course, and Piper is so excited to see her she tries to leave while in the middle of her job. When she finally does run into Alex in the dining room, Piper’s feigned innocence of how Alex got back inside is as nauseating as Morello and Nicky’s cutesy conversation is to Piper. Last season, Piper set Alex up to violate her parole in hopes she would get her only friend back into prison with her—which is a pretty messed up thing to do to put it lightly. I doubt this will stay secret will for long, but it’s highly unlikely Alex will take it well. Alex is both physically and emotionally bruised and the normally tough woman is struggling with how she almost had her life back on track before ending up in prison again, right back where she started. Other characters are also struggling to move forward. Daya is still pregnant and keeping up the charade that Pornstache is the father of her baby. Speaking of secrets that can’t stay secret forever, Caputo knows the truth about Daya and Bennett but is hiding it to save his own job. Bennett doesn’t do the best job of staying away from Daya like he is supposed to, and his encounter with her family on Mother’s Day is painfully awkward. While Daya is reluctantly looking forward, other inmates have flashbacks that share a little more of their backstory. Poussey’s flashback is one of the sweetest. She had a great relationship with her mother and is missing her very much this Mother’s Day. In their flashback, she is reading the Calvin and Hobbes comics, and her mom seems kind and supportive. She seems to be one of the few inmates who had a good relationship with her mother, and it ended much too soon. Healy’s flashback was one of the most troubling, and his mother was clearly unwell. A younger Healy brings breakfast to his mother as she’s writing on the wall of her bedroom with what I hope is lipstick but what looks sort of like blood. She throws something toward Healy’s head before inviting him on the bed to dance with mommy. When the Mother’s Day celebration starts in the present day, we finally see what the inmates have been working on. Like everything else in this prison, everything’s a little off. There is no candy in the piñata, the face painting station is more about make up and teardrop tattoos, and the windmill on their mini golf course is going too fast to let any golf balls through. 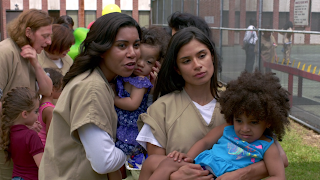 But people still have a good time seeing their kids and mothers, until it all comes to a halt when Daya’s little sister gets lost and the prison literally rings the alarm. In one of the saddest scenes in the episode, the fantasy of having fun, uninterrupted family time dies when at the sound of the alarm, the inmates lie down on the ground where they are. This motion is practiced and routine to them, but their families are confused, and the kids don’t know what is going on. One little girl covers her ears and ducks down on the ground as if she can hide herself from what is happening all around her. That desire to hide, to wish your surroundings away from you, is something everyone can relate to, and I’m sure the inmates at Litchfield feel that way too much. Especially after going through the emotionally draining Mother’s Day at a broken down, corrupt prison they can’t escape from, even for pretend for one afternoon. There’s so much good stuff in this episode I haven’t even been able to touch on yet. What was your favorite part, and who are you most glad to see again? Poussey finding a Calvin and Hobbes comic when she was cleaning up after their celebration destroyed me. As did Maria screaming after her baby when Yadriel told her he wouldn’t be bringing their baby by any more to see her because she’s getting old enough she’ll start to remember the visits. That’s it, welcome back to Litchfield! We’ll try to get reviews up fast since all the episodes are out, so please check back as you’re watching! I really love Poussey the best; I just love her flashbacks. I also really loved that scene with past-Pennsyltucky being forced to drink Mountain Dew by her mom. And the scene with Maria and Yadriel was just heartbreaking, and I can't wait to see how that story develops, because I am really hoping for a happy ending there.